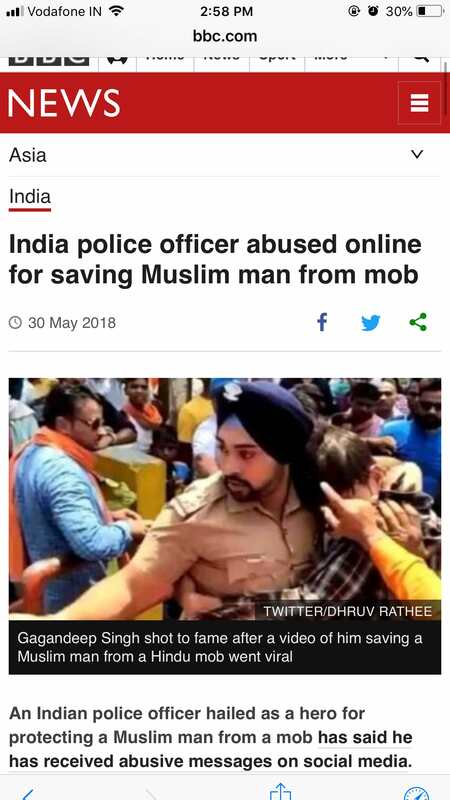 Yesterday, BBC published an article titled ‘India Police officer threatened for saving Muslim man from mob’ claiming Gagandeep Singh, the Sikh police officer who protected a Muslim guy from a mob, was facing death threats and has been sent on leave. The news was also picked up by other international publication, The Daily Mail. Daily Mail too published the report. OpIndia got in touch with Ramnagar Police Station, where Gagandeep is posted and talked to the officials who denied any such threat to Singh. Even as ‘liberals‘ and other foreign media persons refused to believe the official version denying such threats, putting BBC report on a pedestal, BBC has silently put up a correction that they no longer believe that Singh faced death threats. They even changed their story to ‘online abuse on social media’. BBC changed the story completely. Interestingly, BBC and Daily Mail have a huge readership in the UK which is home to over 4 lakh Sikhs.